Didn’t I say we were safe at the dock of Apataki village? And that we could sit this weather system out over there? Well, I was wrong. And, didn’t I say that things can always be worse? Here, I was right! With all the rain, the dock was a bit cleaner, and with a steady north wind, the mosquitoes stayed away, while we were pinned to shore. Every three hours – day and night - we needed to adjust our fenders, because of the tides moving Irie up and down and the funky currents moving us forward and backward. But, it was flat and comfy. On our first day of planned rest, we discovered that our credit card was used fraudulently, somewhere in the US. Great… This seems to happen to everyone at least once, but how do you deal with it from the middle of the Pacific? The advantage of “living” in a village is that you can just walk off the boat and enter the one phone booth. Unfortunately, in French Polynesia, you cannot call an operator for a collect call from public phones, as we found out soon enough. To make a long, tedious, patient and frustrating story short: it took us ALL day to get through to an operator from a landline of a friendly villager to call our US bank collect. After the last hour, we understood that they would send new cards to Mark Kilty, Poste Restante, Village Niutahi, 98762 Apataki, Tuamotus, French Polynesia! We will see if and how that materializes! During the night that followed, a massive squall hit us. 30+ knots of north wind smashed us against the dock and churned up the channel. Generally a pretty well protected spot from the North, East and South, the combination high winds and funky currents created chaos and Irie was wildly pitching attached by four lines to a cement dock. Again, not a good scene and this time, there was no getting away, even if we wanted to. Luckily, the storm only lasted half an hour, but we learned our lesson. Since we needed to leave immediately, there was no way of waiting for less wind or slack tide. A few strong guys pushed us off the dock and there we went! 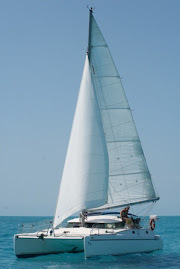 In strong opposing currents of 4 knots, Irie was jerkily pushed left and right. Mark did a great job steering us through the eddies (little whirlpools) and preventing us to turn sideways. The small engines were on full throttle, while we tried to get out of the pass and into the lagoon. What followed was an even more hair rising experience to head north to safer grounds. We ended up having to motor for many hours, and it wasn’t one of those “turn the engines and the auto pilot on and relax” kind of trips! We don’t even like motoring in the first place. No, the event was slightly more exciting. Maybe interesting to the adventurous spirit reading these posts, but less so for the ones being in the midst of them. Mark and I had to drive into the wind and into the waves the whole time with 100% concentration. He had to hand steer (the autopilot could not manage these conditions), while I was vigilantly on the look-out. No time to eat or drink, get sun protection or a rain coat. Before long, the full on storm and weather system was upon us. This is when a cruiser is usually safely holed up somewhere comfortable… We had left too late. The wind was blowing 30 – 40 knots; the lagoon waves were 6 feet high and close together! During the constant squalls – with even bigger bursts of wind – the rain was driving down and pelting our faces and bodies. Waves were crashing over the bow and into the cockpit, swamping us. I was on deck, fully exposed to the elements (which included enough sun to filter through the clouds and burn my skin and scalp – I lost my bandana overboard early on - during those hours), with little visibility. While Mark focused on the instruments (our luck was having accurate charts of the Tuamotus! ), I stared ahead, looking for pearl farm buoys, waiting to foul our propellers. And, this way we continued on, missing reefs and maneuvering around floats, while shivering from being cold and tasting salt water. For six hours! That’s how long it took us to cover those 15 miles. Do the math… I will not repeat here what either of us screamed during this dreadful day. All we wanted upon arrival in Apataki was to have some rest before starting work in the boat yard. What we learned the hard, Tuamotu way is that from the moment there is any kind of north wind, you motor north, into wind and waves, and, if there is any kind of south wind, you do the opposite. Point is, you always end up motoring head into anything blowing, because that’s where you will find protection. Or, you have to be really good at knowing what the weather men mean with their ambiguous forecasts and plan well ahead! At 4pm, we had enough light to drop the anchor away from the reefs – there might be some coral heads underneath us since we are anchored in 58 feet of water and can’t see the bottom – and had breakfast, lunch and dinner all in one. Then, we went to bed for our first decent night of sleep in ten days! At least we are safe and comfortable – for now! And, it seems to be pretty here as well!